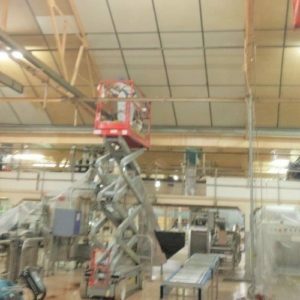 APT was asked to find a solution to the industrial high-level deep cleaning within a food manufacturing plant. 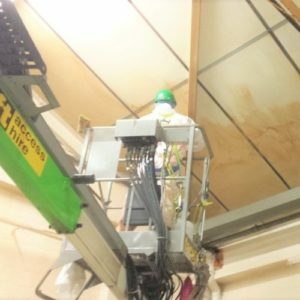 We needed to deal with heavy build-up of hardened oil and grime that had formed over time on high level surfaces throughout one of the key production areas. These areas were difficult to access or not accessible to their internal cleaning operators. The client was carrying out the improvement works as part of their BCR audit. A recent internal audit identified the potential risk of contamination to some of the processing areas. The auditors listed a programme of improvement and contacted several commercial and industrial cleaning companies to look at the deep, high level cleaning. These companies did not respond or declined to quote due to the nature of the work, complexities and access difficulties. Any cleaning operation needed to minimise disruption to production. APT surveyed the production areas and recommended cost-effective cleaning options for commercial deep cleaning equipment and the high level heavily soiled surfaces of production machinery. A health and safety plan along with a suitable work schedule was agreed. 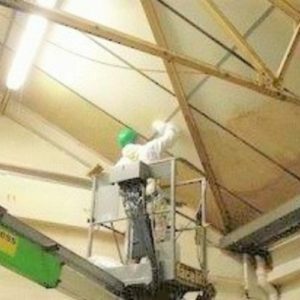 APT Powermax 2020, which is a specialised food safe, heavy duty degreaser, was used to clean and degrease all high-level surfaces, under roof ceiling panels, all steel work, extractor, pipe work, cabling and ducting. A meeting took place to understand the existing methods used to clean the hot oil frying equipment. We implemented the use of APT’s Metasoak, an effective degreaser and carb cleaner to remove the heavy build-up of black carbon deposits and burned hard oils. The client requested that we work in conjunction with their internal hygiene team to support their regular maintenance cleaning programme. Whilst on site we trained them in best practice to use the Powermax 2020. Whilst on site we assisted and carried out an assessment of the current cleaning methods and products used. We were then able to offer the client several improvement options to raise the standard of hygiene, cut costs and reduce labour intensive cleaning. The current deep cleaning of the heavy oil frying and extraction equipment included the use of heavy caustic chemicals which produced unsatisfactory results. After liaising with the plant engineers and operatives we were able to introduce and have approved an alternative, safe aluminium cleaner, Metasoak, used to degrease and decarbonise both the steel and aluminium metal surfaces. We offered further improvements in cleaning methods and adaptations to some of the equipment to allow some of the panel to be made demountable so they could be cleaned automatically. Another proposal was to allow for manual, low pressure, heavy steam cleaning of intricate surface areas. This method would further reduce safety risk to operatives and allow a more effective and quicker deep clean which would result in large annual labour and chemical cost savings. The list of improvements, application and equipment adaptions were all passed to the technical and hygiene officer for approval and implementation. Several other smaller key proposals were made and are part of an ongoing improvements programme. 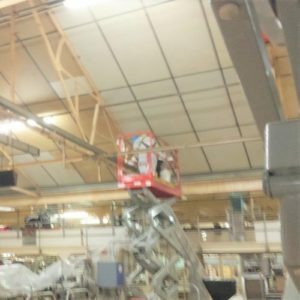 “I was very impressed at the level of knowledge and expertise of our production processes and their interest and proposals offered to improve cleaning standards throughout the production areas. This I found was very unique, they did not just turn up and carry out the cleaning and leave. We found this information invaluable for improving our internal cleaning programme. The APT team approached the difficult cleaning tasks with great professionalism, and they kept my operational staff and I updated throughout the project. Their operatives had no issue in working and assisting my hygiene team and offered them help and training to use both chemicals and materials. They were extremely helpful and assisted with several improvement measures which we will now be implementing going forward. The plant managers and I are very confident that APT will be of great help to us in all future projects and we will be recommending them to carry out regular and ongoing deep cleaning of our plant.